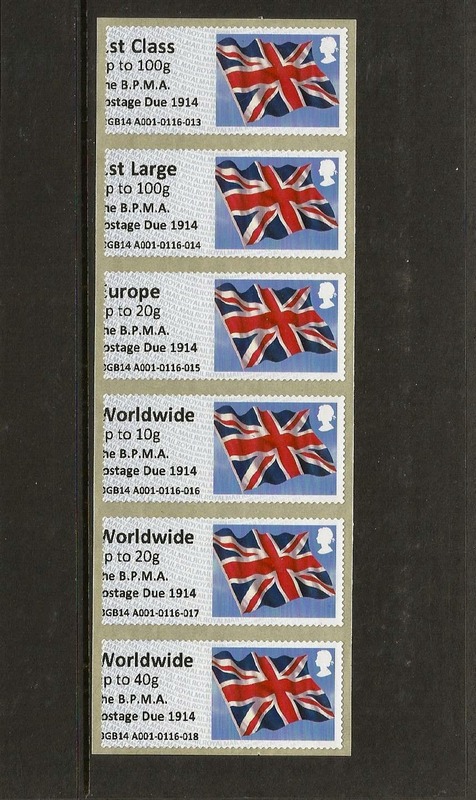 BPMA Post and Go machine produces split strip oddity. From my brief attendance at Freeling House whilst at Stampex I was under the impression that if the P and G machine failed during a transaction requiring the machine to be opened, the transaction was cut short and the buyer rarely obtained all the stamps that had been paid for. Maybe the new machine works in a different way. 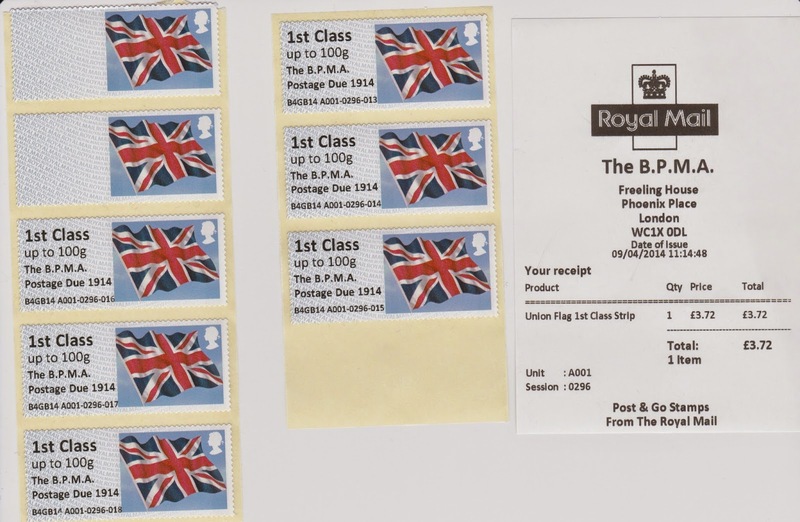 I visited the BPMA this morning and ordered a collectors set of each + 6 x 1st Flag to use for postage. The sets came out okay but the 'strip' of 6 x 1st didn't initially appear so I had to call the guy from the office. He saw a strip of 3 stamps still attached to the printer-throat. He then checked the machine and it said there should still be 100+ labels available to print. Nevertheless, he went and got a new roll then opened the machine and discovered it was indeed out of Flags. So he carefully removed the 3 that had printed from the old roll, inserted the new roll, and then set it 'live' again with the result that the remaining 3 Flags I ordered were delivered but with 2 'no value' stamps as well. I'll leave it to somebody who visits these machines more often than I do to explain whether this would be normal for the type of machine now at the BPMA. Has anybody noticed that the letters B.P.M.A. are spread wider apart than those dispensed by the old machine? It looks like Windows print manager it at play here. It’s not unknown that when you fix a printer error that occurs whilst the printer is in action, Windows will remember what has been printed and what remains unprinted. The printer once satisfied that everything is ok, will then proceed to start the print job again, leaving blank pages for what has been printed and producing text/image when it reaches the unprinted part of the document. I have noticed the B.P.M.A. are spread wider apart than those dispensed by the old machine.